I have always been fascinated by words, especially words that begin with a Z. 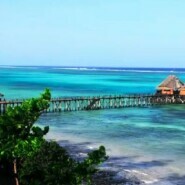 The island of Zanzibar off the east coast of African and lying in the Indian Ocean beckoned for a visit. I was not disappointed. Zanzibar is a part of the African country of Tanzania. The island is large and very African in culture with a hint of European influence. I was charmed and spent one of the most pleasant travel days ever. I spent the day walking through a spice plantation with a guide who spoke fluent English. The plantation was not orderly as one would imagine, rows of plants lined up in order. Rather it was a hodgepodge of plants and trees some under and some not under the canopy of tropical trees, vines and plants. Here a cinnamon tree, some ginger plants, a pepper tree, a nutmeg tree, a tree with cloves and coffee plants. The rain fell in mist. The plantation was quiet, the mist a caress, an enjoyable day.